This recent biography of a biographer, and if Winifred Gérin’s work on Elizabeth Gaskell is included, biography of a biographer of a biographer, is meticulously researched, perceptive and really surprising. Based on her many letters and an unpublished memoir, it has some of the qualities of a spy thriller, because Winifred Gérin’s life was much more than that of a dedicated library-dweller. Until I read Helen MacEwan’s revelations about her, I knew her simply as the author of Charlotte Brontë The Evolution of Genius, about which the Times reviewer of the time (1967) wrote “…her book holds the reader as closely as a novel.” The same could be said about this one. Winifred Gérin had strong connections with Brussels, which certainly triggered the author’s initial interest in her (she lives and works there today), managed to escape from the advancing German armies and the Vichy French during the Second World War, got involved with secret war work with her Belgian husband when she reached England, wrote poetry and plays, then moved to Haworth to find her real vocation and to fall in and out with the Brontë Society. The first chapter with its account of her childhood in a cultured family (the Bournes) in London’s Norwood is as fascinating as all the others: a love of literature (Dickens in particular) and the theatre was encouraged, with stories and dramas from history, especially those involving monarchs. She became infatuated with the Stuarts and Marie Antoinette, heard Jane Eyre read to her by her mother Katherine at the age of seven, acted out historical or allegedly historical events, like King Charles II hiding in an oak tree, with her siblings, and lost a beloved brother to diphtheria. The parallels with the young Brontës are drawn out by the author. She attended concerts at the Royal Albert Hall, becoming spellbound by the stars of the day, like the violinist Fritz Kreisler and the pianist Vladimir von Pachmann, “who wore his white hair to his shoulders like Liszt and would keep up a running commentary for the audience as he played.” There was so much intellectual stimulation that there was little need for governesses, mostly German Fräuleins who were regarded by young Winifred as “nuisances”. She was deeply affected by a joyous stay in Paris, which much later was to give her an understanding of the continental, Catholic world of Brussels, “just as her subsequent romance with a Belgian gave her a special interest in the spell cast on Charlotte by her Brussels teacher Constantin Heger.” MacEwan builds plenty of foreshadowing into her construction. As in a novel, the reader gets a taste of what is to come, often at the end of a chapter. Eugène Gérin was a well-known cellist, brilliant by all accounts, met by Winifred in Plombières-les-Bains, a pretty spa town in Eastern France, described in concert publicity as a “violoncelliste poète”. 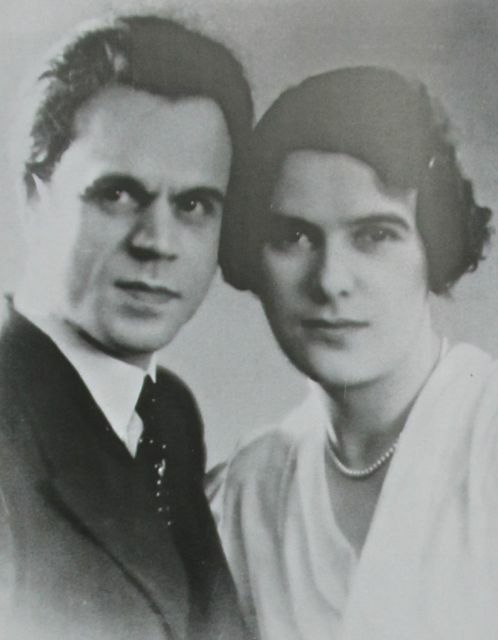 They matched each other well, and she became close to his family before they both had to move on to escape the invaders in 1939. After a series of stressful journeys, often on slow, packed trains, accompanied by a cello and a pet cat in a basket (! ), they reached Nice, which was in the southern section of a divided France sapped of hope and controlled by collaborators. The account of their time in a rented flat there, when they were able to offer what help they could to a few of the large number of Jewish refugees in the area before managing to make it across the Pyrenees to Franco’s Spain and then neutral Portugal, is really quite gripping, reminding me of Marcel Ophüls’s famous documentary film Le Chagrin et la Pitié (The Sorrow and the Pity). In England, Eugène assumed a Walloon accent for propaganda broadcasts to the French-speaking parts of occupied Belgium. The detailed references in the book are many: I was moved to find out more about the death of the film actor Leslie Howard, who was in a plane on its way from Portugal to England shot down by a German fighter over the Bay of Biscay in 1943. I’d seen the same path empty I must climb. The Brontë Society at the time of the Locks was ‘a body noted for its unity and decorum’ according to Fred Taylor, the Keighley Borough Librarian, dominated by mill-owner and solicitor Donald Hopewell, its president for forty years, with Sir Linton Andrews, editor of the Yorkshire Post, as its Chairman. This unity was about to be lost in a ferocious dispute about the biggest changes to the Parsonage Museum since the construction of the wing added by Rev. Wade in the 1870s. There was a proposal to build an extension at the back to free up exhibition space in the original Parsonage rooms, to make them look less austere, more like Mrs Gaskell’s account of the interior in 1858 after Charlotte’s refurbishment. John and Winifred were in the ‘dead against’ faction, describing the changes as making the Parsonage look like a brightly-painted doll’s house. The acrimonious dispute, which sent the Society into convulsions for several years, led to the resignations of the Locks along with many others. Winifred then began the most significantly productive period of her life, devoting long hours to research, with biographies of Ann, Charlotte, Emily and Branwell as well as Elizabeth Gaskell, The Young Fanny Burney, Horatia Nelson and Anne Thackeray Ritchie. John Lock in 1965 finally produced Man of Sorrow: Life, Letters and Times of the Reverend PatrickBronte, 1777-1861, which was long in the making. One problem for a biographer treating the Brontës separately is a need to repeat swathes of detail which applies to all of them, avoided by later operators like Juliet Barker, who treated them together in the same fat volume: the Gérin biography of Emily is slim, however. “Winifred always wrote about people with whom she felt an emotional connection and affinity,” states McEwan in her preface. The same applies to Helen MacEwan: Winifred Gérin is brought very close to the readers of this book. The Brontë Society and the Brontë Parsonage Museum in Haworth have invited the novelist Tracy Chevalier to be a “creative partner” for the bicentenary year, to explore creative ways of responding to the Brontë legacy. The acclaimed writer, whose works include Girl with a Pearl Earring, has developed an exhibition called I Shall Go Off Like a Bombshell which, through objects and quotations “explores the contrast between Charlotte’s constricted life and her huge ambition”. The whole article, with illustrations, can be viewed here. A new website will soon be online (http://bronte200.org/) devoted to the bicentenary.